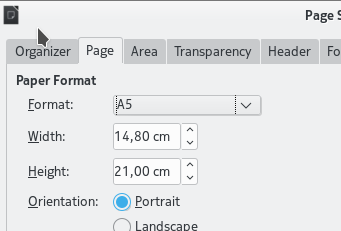 KReportPageSizeInfo pageSizeInfo contains few page sizes. Before we freeze the API how about adding more, at least as many as "PageFormatInfo pageFormatInfo" in calligra.git and LibreOffice has? Entire QPageSize::PageSizeId list would be overkill indeed. It is reset to size based on 'page size type' selection if the type is not custom. That's different to KReport. Picking some non-custom type shows it's actual size like 210x297mm for A4. Technically it's not hard to have that. Backward compatibility would not be affected (? ).